Ascending Butterfly: Summer Skin and Eye Care On The Go with @Sephora! By now I'm sure that there are very few of you left that has been able to avoid the against your will 'product dump'. That's when you bring your favorite, must have at ALL times beauty or skincare product with you and the fine folks at the airport either 'confiscate' it, or literally dump it in a big bin right before your eyes! Not even celebrities have been immune to this outrage, and several famous comedians have even included this horror into standup, garnering big laughs because we all can relate. So how do you bring your favorites along with you and get them past the ever watchful eyes of the TSA? Samples of course. Yes that right sample sizes in CLEAR see through TSA regulation cosmetic kit cases! I know what you are thinking right now, but Ascending Butterfly, what if your local cosmetic counter won't give you any samples, or (*cough*) has run out of them? Have no fear my butterflies, Sephora is here. They have found a great way to allow you to bring your favorite beauty must haves with you and not even raise a suspicious eye brow from the always vigilant scanner, it's called 'Sephora Favorites'. I love this kit, the only thing I didn't try myself was the Self-Tanning Cream as I'm melanin blessed with a lovely golden glow I was born with. But I did share this one with a 'pale' friend who raved about it. Which didn't surprise me as I use a few Clarins products already myself. Some of the kit I was already familiar with like Tarte's Smooth Operator (LOVE IT) and ExfoliKate by Kate Sommerville (LOVE IT! ExfoliKate is actually my favorite product in Kate's line), and got to discover some new faves which is always fun, like Josie Maran's Argan Oil (I reached out to them a long time ago, but never heard back), so I'm glad I finally got to try it, I never really got why everyone was raving so much about Argan Oil, until I tried for myself! I also like the Perricone No Foundation Foundation and the Ole Henriksen Truth Serum (which my skin really seemed to drink in the day I used it!). These products are best-sellers with good reason. My personal suggestion is to buy 2 kits, one for your luggage, and one for your 'desk kit' at work. 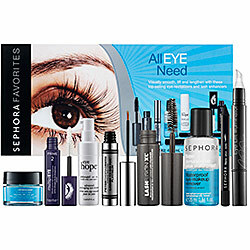 They say eyes are the windows to the soul so let yours shine with the Sephora Favorites All Eye Need set. This eight-piece kit includes treatment products to cleanse and revitalize delicate skin and liners and mascaras to define the eyes and enhance lashes. Surprisingly except for Tarte's Primer, most of these were new to me, so I really enjoyed testing this kit out! The big standout for me was the Philosophy Eye Hope which I had not tried before this. Definite re-buy. I also love the Sephora Collection Nano Eyeliner in Midnight Black, somehow it doesn't matter how many great colors I try in eyeliners, I always go back to Black. I also liked the Ole Henriksen Eye Gel and Peter Thomas Roth Lashes To Die For Platinum. I also liked the Fusion Beauty Lash Fusion XL™ Micro-Technology™ Instant Lash Volumizer as I have never tried an eyelash curler in my life. Something about those things scare me, they seem like a vice for eyelashes and I always think they are going to pull your lashes out at the roots! What I love about this kit, is that I don't have to neglect my eyes while I'm away. I can put on my eye cream at night while I'm sleeping and let it work it's magic. I'd also recommend buying 2 kits for yourself, one for your luggage, one for your desk at work. And I'd personally recommend both kits as great stocking stuffers! 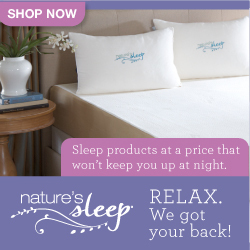 It's never too early to knock out your holiday shopping. 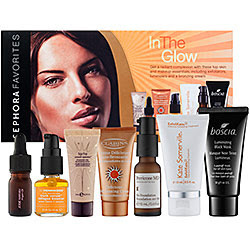 These are two of a variety of great boxed kits that Sephora sells calls 'Sephora Favorites', they are value sets that combine a variety of Sephora Favorites and are a beauty addict's dream come true. Each limited-edition set features deluxe samples of Beauty Editor's latest fixations—all for $40 or less!—and the options are endless. So, whether you're looking to go green, score smudge-proof eyes, hydrate head to toe, or spritz yourself pretty, there's a perfect box for you! The hard part? Deciding which one to test drive first. And while I'm sure most of you already have it bookmarked by now, you can keep up with all things Sephora on Twitter and Facebook as well! FTC Disclosure: This is not a sponsored post. This is not a paid post. No monetary compensation has been received. I was sent both kits for editorial consideration. It doesn't how many times I travel, it always, inevitably happens to me. The biggest dump was on my honeymoon when TSA took ALL of my "oh-so-cute" lotions, "body powders," "designer sunscreen," just to name a few items. It's horrible. Since that experience, I travel with small sizes/samples and my @Nordstrom and @Sephora ladies are awesome with me - I always get what I need because I always buy full size. And, I only stay at hotels that I know carry "good" products, like Kimpton (they carry @Aveda), so I don't have to take shampoo, conditioner or lotion. who doesn't love Sephora and all of their great products for looking and feeling good?